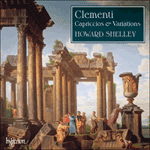 In 1786–7 Clementi issued three individual compositions for solo piano: La chasse Op 16, the Op 17 Capriccio, and Musical Characteristics Op 19. La chasse is in effect a three-movement sonata with hints of hunting-horn motifs in the outer Allegros; the writing here, thin-textured and harmonically straightforward, is fairly standard for its time, but the effect can be exhilarating, particularly at a brisk tempo. En 1786–7, Clementi fit paraître trois compositions pour piano solo: La chasse op. 16, le Capriccio op. 17 et Musical Characteristics op. 19. La chasse est en réalité une sonate en trois mouvements dont les Allegros extrêmes font allusion à des motifs de cor de chasse; l’écriture, mince de texture et simple d’harmonie, en est assez standard pour l’époque, mais l’effet peut être grisant, surtout aux tempos alertes. 1786–87 publizierte Clementi drei Einzelstücke für Soloklavier: La chasse op. 16, das Capriccio op. 17 sowie die Musical Characteristics op. 19. La chasse ist tatsächlich eine dreisätzige Sonate mit Anklängen an Jagdhorn-Motive in den beiden Außensätzen (beide mit Allegro überschrieben); das harmonisch geradlinige und schlank strukturierte Satzgefüge ist für die Zeit recht üblich, doch der Effekt kann belebend wirken, besonders bei den zügigen Tempi.